Has any borough, neighborhood, or stretch of land in New York City been renamed as many times as Roosevelt Island has over its 400-year history? Called Minnahanock by the Canarsie Indians, tribal leaders sold the he two-mile long island to Dutch governor Wouter van Twiller in 1637. Now part of New Amsterdam, it was renamed Varcken (Hog) Island for the pigs the Dutch raised there. In 1666, with the English now in control, the island fell into the hands of Captain John Manning and was renamed Manning’s Island. Twenty years later Manning’s son-in-law, Robert Blackwell, inherited the island. He decided it was now Blackwell’s Island. 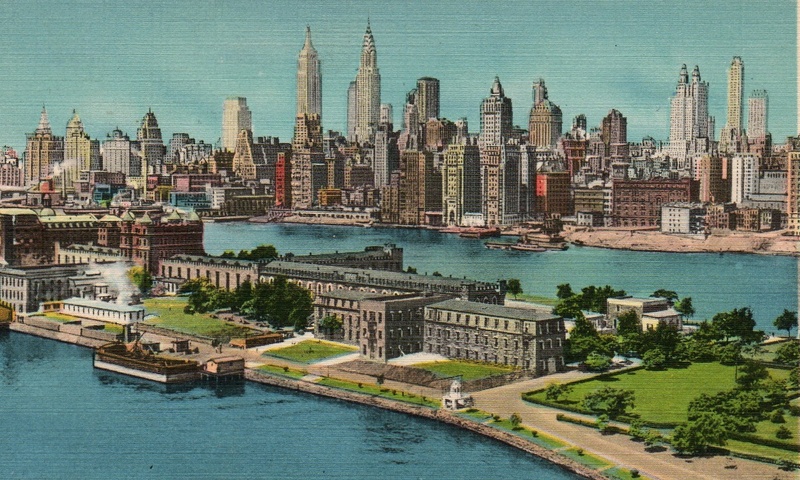 The city of New York bought the island in 1828 for $32,500, building hospitals, poorhouses, and prisons on what was formerly farmland. The Blackwell name officially endured until 1921, when it got another moniker: Welfare Island. Finally, in 1973, with plans to turn the island into a mostly residential neighborhood, the city renamed it Roosevelt Island. Lets hope this one lasts! This entry was posted on September 26, 2009 at 5:25 am and is filed under Midtown. You can follow any responses to this entry through the RSS 2.0 feed. You can leave a response, or trackback from your own site. greeat picture. a little bit of manhattan’s old industrial/working class east side there on the right. I remember around 1976 or so a few of my friends and I rode our bikes over to the island from Queens. Although you were not allowed to ride a bike across to there at the time, we just rode quickly past the guard, who yelled at us. Once over to the island, it was a desolate and scary place. It was night time, and there was little there. There were roads, and many abandoned hospitals and building, all of which looked straight out of a horror movie. We rode around for a while, but I think we were too scared to actually go into any of the buildings, or even get too close. I wish I had some pics of the way it looked that night! I wish you did too! Would be neat to see now. How poignant a succession of conquerors tried to dedicate a piece of Native American land to themselves, only to have the name changed at an accelerating pace…The Canarsie Indians would have been wise to understand no piece of earth is ever owned. In the end, the earths owns us. Just because I’m really contrary, I’d love to see the City re-name the island again. To Minnahanock.